These sets are great for kids, with no odor, no caps to lose, and bold, opaque colors. 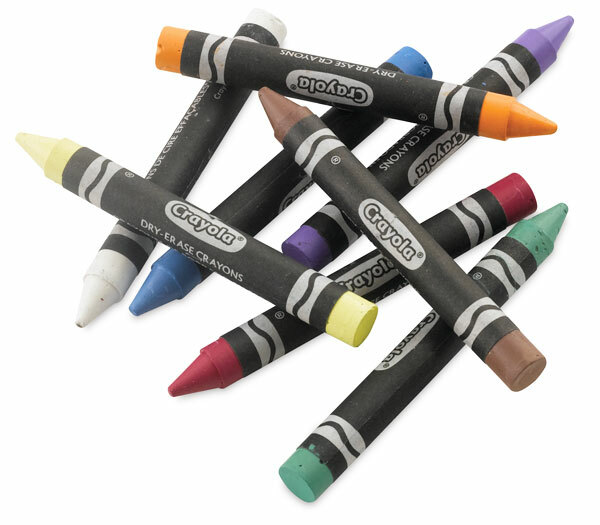 Crayon marks wash cleanly from hands and clothing and, unlike traditional markers, Crayola Dry-Erase Crayons won't dry out when left uncapped. Dry-Erase Crayons, Set of 8 — This set contains eight large-size crayons, including one each of Red, Blue, Green, Orange, Yellow, Purple, Brown, and Black. A built-in sharpener and an E-Z Erase Mitt are also included. 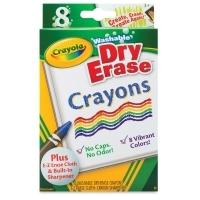 Brights Dry-Erase Crayons, Set of 8 — This set contains eight large-size crayons, including one each of White, Razzmatazz, Mountain Meadow, Light Blue, Light Yellow, Yellow-Orange, Light Violet, and Brown. A built-in sharpener and a machine-washable eraser cloth are also included.